This is the fourth in a series of 6 posts on our perspective on sustainability. Our first post focused on the HPA definition of sustainability while the second explained what we mean by ’social relevance’, ‘environmental responsiveness’ and ‘economic viability’. The third dealt with the notion of ‘Common Good’ in contrast to ‘Self-Interest’, and why the pursuit of the Common Good leads to better sustainability. 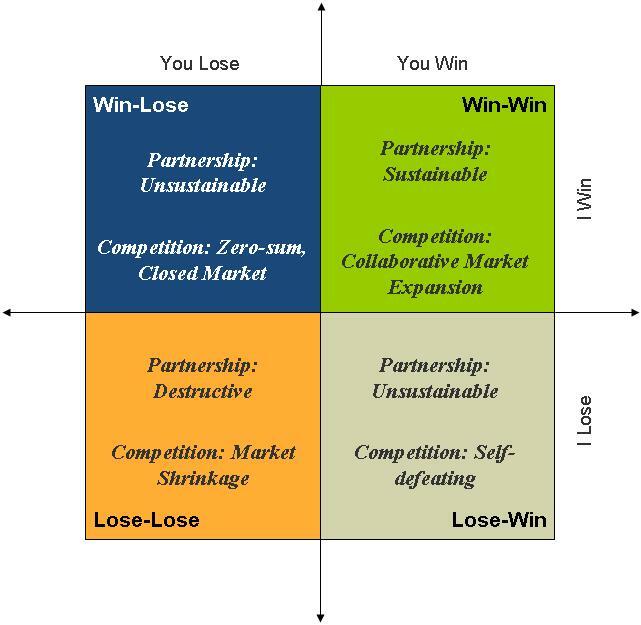 This post discusses the challenges along the path to sustainability in a competitive situation and also elaborates upon the key areas of difference between partnerships and competitive relationships. Are you suggesting that in a poker game winning players should start losing on purpose so that they can win eventually? How does sustainability work in a competitive situation? Why should a business yield any ground to competition? What is the common good when it comes to competitors? For any given player in a poker game, the game represents a group of competitors, not an ecosystem of stakeholders acting in partnership with that specific player. A poker game, like all competitive games, is about winning and losing i.e., a zero-sum game. Such games are designed to result in winners and losers – everybody cannot win! Otherwise, where’s the fun? Zero-sum games hone the spirit of competitiveness and the ‘killer instinct’. Real life is neither a closed system nor is it close-ended in time, whereas games have a definite beginning and a definite end, a fixed set of players, clearly laid out rules and a finite, pre-defined number of possible outcomes. Zero-sum need not apply in all real-life situations. Unfortunately, though, not everyone sees that, and people tend to default to zero-sum thinking. Through our work, we hope to bring about an attitudinal shift that makes people look for win-win first. By default, every situation can result in a potential win-win outcome for all, unless there is evidence that is has got to be win-lose. This is one of our key messages. Partnerships are based on interdependence. It’s not about one side winning and the other losing – that simply won’t work. In a partnership everybody must have a win, by and large, or else the partnership is not tenable. You may have micro-situations where someone wins (or wins more) and someone else loses (or wins less) and that’s OK. But if one partner wins almost all the time while the other loses almost all the time, the partnership is just not sustainable – it defies the very interdependence it is based on. This is empirically self-evident and does not need to be proved as a theorem using deductive logic. The business stakeholder ecosystem is a value network of interdependent partners, not competitors. Mature and responsible players will look to negotiate a win-win outcome in situations where partners have different needs and bring different agendas to the table. That said, let’s go back to the poker game analogy. Let’s envisage a very real situation, in which a few friends meet on weekends and play poker. This can continue ad infinitum as long as it doesn’t happen that a single player consistently wins and eventually leaves the others broke. In a card game there are two factors that determine the outcome, broadly speaking – the cards one is dealt and the skill with which one plays them. A player cannot control what cards are dealt to them and you could call this the luck factor. If a player starts to do that, it is called cheating and we’ve already talked about why that’s not sustainable. What a player can control is their own card play, but not the cards that arrive in their hand in a given deal. Hence it is a statistical near-impossibility that one player wins all the time, assuming fair play and assuming a more or less even distribution of skills around the table. This is also how it works in competitive scenarios. Sustainability does not mean that a better player should allow others to win. Players should follow rules. If one player’s skills are outstanding and they end up winning most of the time through fair means, notwithstanding the luck factor, then they should look to play in their own league if they want to keep enjoying the game. If they play with significantly lower-skilled players, they will take away all the wealth and others will go bust. Game over. In business this is the equivalent of one player dominating the market by leveraging their ‘sustainable competitive advantage’ and edging out competitors. They don’t yield any ground consciously, but over time, but they could become complacent and the other players could overcome barriers, make a comeback and give them a run for their money. Life is open-ended and keeps going on indefinitely and today’s loser may become tomorrow’s winner. Games, like novels and movies, are close-ended and finite. The common good in a competitive situation will be evident in issues that impact the long-term growth of the industry and market as a whole. That’s where competitors may collaborate on initiatives to consolidate and stabilize the economics of that industry and to improve and grow the market. Or they may simply share best practices to improve efficiency in non-competitive areas. Note how automobile manufacturers in the US came together to approach the Government for help recently. Also note how Toyota’s performance is different from, say GM’s, thanks in part to their green initiatives, while other automakers simply went on a downward spiral, thanks in part to their alignment with the vested interests of oil companies. To summarize, we are saying that when it comes to partnership, it is most sustainable to ask the question “What’s in it for me?” after answering the question “What’s in it for my partner?” as compared to either not asking “What’s in it for me?” at all (i.e., charity), or only asking “What’s in it for me?” (i.e., primitive self-interest). Our next post will look at the sustainability theme from an investor’s perspective and will explore how it plays out for the shareholders of an enterprise that embarks on a sustainable business transformation journey.